Delicious iguana meat, just waiting to be removed from the iguana. During a security screening at the United States border with Mexico, customs officials discovered a pretty odd secret cache on board a bus full of Mexican migrants. A woman was questioned and deported over 58 pounds of confiscated iguana. The iguana meat, valued at $1600, was stuffed into two ice chests and hidden on board a bus heading from Mexico to the United States. The iguana meat weighed in at 58 pounds, and was mixed in with corn dough. Apparently, the iguana meat was going to be used to make tamales, though not for Taco Bell. Here’s my question. Do you really have to process iguana meat and import it? 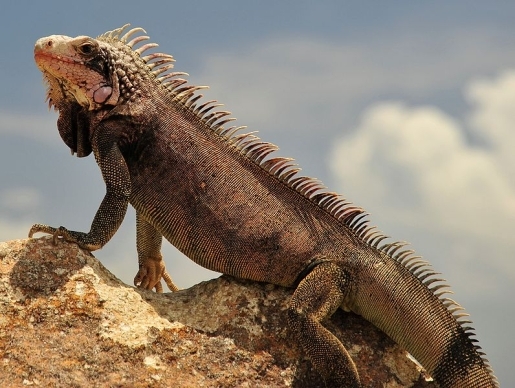 Because there are lots of iguanas just laying around in Florida, and no one’s going to complain if you pick one of those up and fry him in some dough. In fact, Floridians might thank you for it! You can eat weird meat AND help stop an invasive species at the same time! Isn’t that a good community service and better than bringing in iguana tamales from Mexico?